The Delaware Technology Student Association (DETSA) State Conference will held on April 3-4, 2019 with nearly 1000 students, advisors, and judges from up to 58 chapters will participate with nearly 1746 total contest entries in 62 contests. The top 3 medalists will be recognized in each contest. 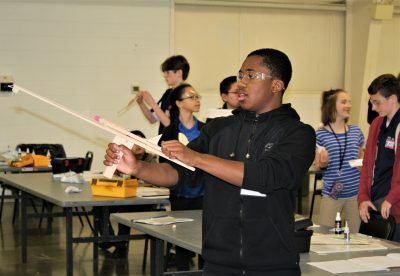 Sample contests include: Architecture, CAD, Digital Video Production, Dragster Design, Engineering Design, Flight, Maglev Vehicles, Robotics, Rocketry, Structural Engineering, System Control Technology, Video Game Design, and more. Each TSA competitive event requires students to apply engineering, technology, solve technical problems, conduct research, and invent solutions. The Technology Student Association (TSA) is a Career and Technical Student Organization (CTSO) dedicated to students interested in the future of invention, innovation, engineering, and technology. Through TSA, members have the opportunity to participate in technology-focused competitive events, take part in community service work, and become leaders for the organization in their school, state, and at the national level. TSA incorporates curricular and co-curricular experiences to emphasize the importance of knowledge, leadership, skill development, and teamwork. A list of the 2018 state contest winners is here. Top medalists will earn the opportunity to represent Delaware at the TSA National Conference at the National Harbor, Maryland (June 28-July 2, 2019) where over 8,000 students from throughout the world will participate. To learn more about DETSA, please visit: www.detsa.org or contact Mike Fitzgerald by phone at: 302.735.4015 or by email at: Mike.Fitzgerald@doe.k12.de.us.